3 bedrooms, 2 full bathrooms, sleeps 6 . 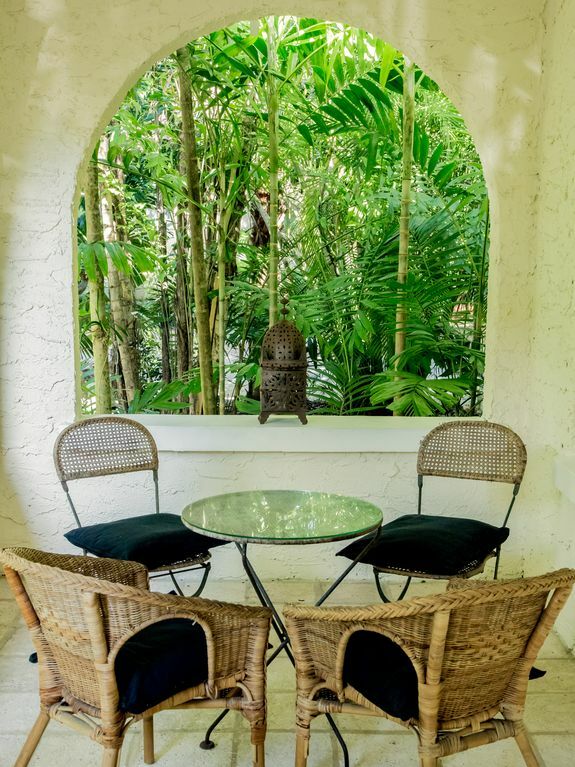 Tucked away behind lush tropical landscaping, our traditional old grove house is a nice blend of modern furnishings mixed with eclectic ethnic accents picked up while traveling the globe. open room in the back with a convenient access to large garage doors for our sailors. I grew up in France where my first profession (ballerina) took me to different part of my country and Europe. Later I came to California where my children were born. During the 90's Nick and I lived both in Paris and Miami while he pursued his fashion photography career. When I first came to Miami I chose Coconut Grove as then it was the center of cultural activities and home of many artists. This has been our home in this unique neighborhood for a long time. The children are gone and we would like to share it with guests on occasion allowing us to travel too. Lots of character, authenticity yet close to everything in Miami. Organic cotton sheets, plush towels. No longer usable. Still nice to look at! Seats 7, up to 9, TV. Drip coffee machine, French press. Nespresso machine. Coffee, sugar start up. French style kitchen (open shelving), small but well appointed. A few children's books and boy toys (cars and trains) Beach toys. Small garden in front of the house that provides privacy from the street but is more for the eyes than any activity. Lots of different golf courses: Key Biscayne and Cool Gables are close by. Our home vintage 1923 features pickled original wood floors throughout , casement windows all around inviting the lushness in. It is located on a very quiet street (cul-de-sac) friendly to pedestrians. Enjoy relaxing and watching the sunset on the open front porch in total privacy, have breakfast in the screened porch surrounded by vegetation. The master bedroom bathes in shades of whites while the downstairs one plays a more exotic tune with african kuba cloth accent or read books in the third bedroom more traditionally appointed. TV sets are in both front and back part of the house. The village is minutes away with its many shops, restaurants, theaters as well as well maintained public tennis courts. It is a 5 minutes walk to Biscayne Bay, Kennedy park and the Fresh Market. A massage therapist for your pampering lives nearby. We had a great stay, definitely hidden oasis! Recommend it to everybody! We had a very great stay in this lovely and beautiful hidden oasis! Also really great and peaceful neighborhood. Francoise was very friendly and very helpful and we get great advice. We could ask her anything. If we would go back to Miami we would definitely stay here again and we could recommend it to everybody. This was in a great location and the house was very cool. Our hosts were wonderful! This house was in a great location and our hosts were wonderful. The house was very, very cool. Close to downtown Coconut Grove, Vizcaya, Fairchild Gardens,....really close to just about everything we wanted to see. Not far from South Beach and the Design District and little havana. We had some wonderful food around town. LuLu's for lunch in Coconut Grove was wonderful. The best salad I have had in a long time. My only reccomendations would be to get a larger TV in the living room. We don't watch much TV, especially on vacation but we do watch the news....and to put up more hooks or towel racks in the bathrooms. I didn't want to throw my towel over the door because the door was painted so we threw them in the dryer everyday. Not very eco friendly. It would be helpful to have a light over the dining room table. A great stay. Thanks Nick and Francouise!! Had an amazing stay here. Everything we needed was there. We were in Miami for Sailing and was great to borrow the bikes to get around. There was just enough room for us 6 girls. This is a real gem of a property in a fabulous location. Sometimes it is all the little touches that make a house a home, this is what Francois and Nick have achieved. From the time i started communication every detail was achieved.Christmas decorations to food selection in place as requested. They deserve way more than 5 stars. Hi Anne, thank you for the kind review. It was a pleasure to meet you and your family however briefly. Nick enjoyed his chat with Jerry over plant life. Glad you enjoyed the neighborhood as it is special indeed. Hope your trip back went smoothly. We wish you a Merry Christmas and a very happy New Year. The house is lovely. The property is beautiful and very private. There are many places inside and out to gather. Francoise and Nick are wonderful hosts! Amenities were perfect. Would highly recommend. Coconut Grove, built along Biscayne Bay is known for its lush tropical canopy . An artist colony in the 50's it still hosts one of the best Art Festival in the country. Our charming village offers some of the best dining, unique shopping, movie theaters as well as two beautiful parks along the Bay: Peacock for concerts and Kennedy for exercising and star gazing. Our neighborhood is proud to harbor some beautiful mansions such as Viscaya, the Barnacle, a museum of Science and Planetarium as well as amazing gardens Fairchild Tropical Garden and the Kampong. It is a 5 mn walk to Kennedy park, Dinner Key Marina and the village from our home. South Beach is a 10 mn drive. A bike path will take you to Key Biscayne or the South Grove. Tennis courts are available 3 mn away and Golf courses within a10 mn drive. Or go to the Seaquarium for a swim with dolphins. Our beautiful Performing Art Center as well as the AA Arena, home of the HEAT, are minutes away by our local Metrorail. Rates are subject to change until reservation is confirmed. Our rates may fluctuate pending the number of guests and the length of stay. Please be as specific as you can when asking for availabity.